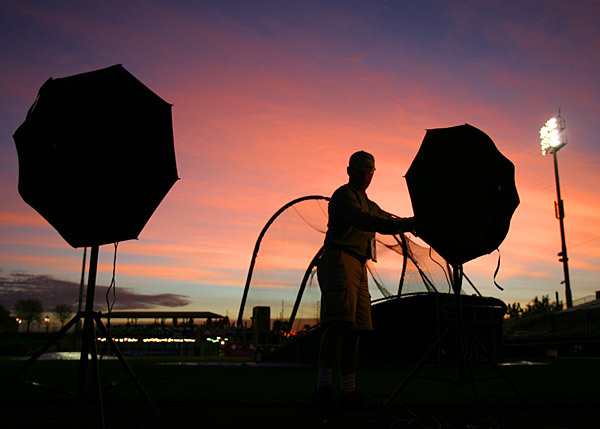 Topps photographer Gregg Forwerck sets up his lights on the field at Scottsdale Stadium at 6:30am at Giants photo day. San Francisco Giants Photo Day: Tuesday, February 28 @ 7:30am. That's right- the annual death march that is the week of photo days ended this morning, much to the joy of photographers in both Florida and Arizona who will be happy to sleep in the next few days and start shooting ballgames later in the week. What exactly is photo day? I went to my photo editor at Major League Baseball Photos, Paul Cunningham, to help explain this rite of spring that many players and pr people wish would go away forever. 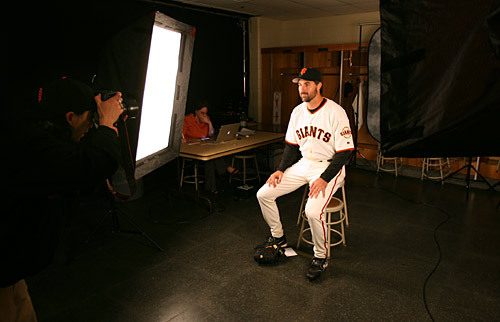 "The annual ritual of MLB Photo Days is little understood and even less appreciated. Photo days are the first opportunity that the teams and media have to collect portraits of all the players on all 30 Major League ballclubs, both new and old. Players and managers grudgingly participate so they can get on with the real business of spring training, playing the game of baseball," said Cunningham. "The ubiquitous Photo Day portrait provides maximum bang for the buck. They are everywhere. They are published all over the web, as they are used by a multitude of baseball websites to accompany a player's bio. TV stations use them anytime they need to show a player's portrait. The scoreboard operators at every big league ballpark use them before every player's at bat during the regular season. Newspapers run them throughout the season and they're used extensively in MLB clubs publications," Cunningham continued. "Because the use is so broad there is an immediate need for these images. That is why photo days are so hectic. Player portraits need to be shot, edited and uploaded in the same day so that they can be prepped and distributed before opening day," Cunningham concluded. San Francisco Giants team photographer Andy Kuno photographs new pitcher Matt Morris as Giants Photography and Archives Manager Missy Mikulecky receives his images onto her PowerBook via wifi. On this particular morning at Scottsdale Stadium there were seven photographers shooting portraits of the San Francisco Giants. Inside the visiting clubhouse there were shooters from the Giants (Andy Kuno), Associated Press (Ben Margot) and Major League Baseball Photos (Jason Wise) set up with lights and backdrops. Outside in the third base dugout and on the field were four more photographers representing Getty Images (Lisa Blumenfeld), Photofile (Scott Wachter), WireImage (Mike Ehrmann) and Topps (Gregg Forwerck). Years ago there were many more photographers set up at photo days as there were more card companies and licensees that needed original portraits for their products. Set up in the visiting clubhouse at 6:30am was the very calm, cool and collected Giants team photographer Andy Kuno. 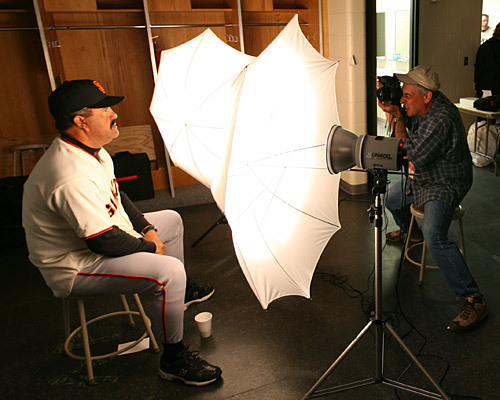 Kuno has been shooting the Giants headshots on photo day in Scottsdale, Arizona since 1999. Every year his job is to shoot the entire 40-man roster, all non-roster invitees plus all coaches and staff. This year Kuno shot 80 head shots. They will immediately be used in the upcoming issues of the Giants magazine and yearbook. This is the first year that Kuno shot digitally utilizing a wireless transfer direct to the laptop of Giants Photography and Archives Manager Missy Mikulecky. Missy was able to see all of Kuno's images pop onto the screen of her Apple PowerBook into Adobe Bridge just seconds after Kuno took the pictures. Many of the Giants younger players were fascinated with this technology and crowded around the laptop to see how their pictures turned out. AP staffer Ben Margot photographs Giants coach Luis Pujols in the visiting clubhouse at photo day in Scottsdale. Kuno has been shooting digital on photo day for the last four years. He says it's not as stressful as shooting chrome because he can see his images instantly and know that he has the light balanced on the players and the background perfectly. Set up next to Kuno in the visiting clubhouse was veteran San Francisco-based Associated Press staffer Ben Margot. Margot photographed both the A's and Giants photo days this year and has only done them one other time a few years ago. The AP has very strict instructions for their shooters. "They just want a mug shot with a sky blue back drop cropped loose- a basic mug shot," said Margot. I shot everyone who sat in front of me this morning from Felipe Alou to Barry Bonds. Bonds snuck up on me. I expected him to show up and he came through without much fanfare. He smiled for me and I took two frames of him. I had never shot him before at photo day," Margot added. That's right sports fans. Barry Bonds DOES pose for the small group of shooters inside while wearing the home white uniform top. He rarely EVER steps outside to pose for the others. "I find it interesting that you can pick up on a guy's personality in 30 seconds it takes to shoot them. Guys like Steve Kline and Armando Benitez were really cool. You can tell who is funny and at ease by just shooting two frames of them. It is fun to see. The A's were more relaxed (Margot shot the A's photo day on Monday, February 27, 2006), accept for Milton Bradley. I waited four hours for Milton Bradley. Guys like Barry Zito, Bobby Crosby and Huston Street were all fun to work with," Margot said. 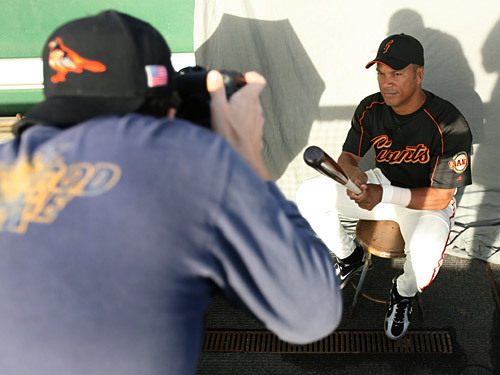 Freelance photographer Scott Wachter, on assignment for Photofile, photographs Giants outfielder Moises Alou in the third base dugout on photo day. Many photographers bemoan the fact that they have to get up so early in the morning to set up their lights and be ready for the early starts on photo day- not Margot! "My wife gets up at 5:00am every day so it's not a big deal for me. I was up at 5:30am this morning and got to the ballpark at 6:00am. I needed the extra time because one of my lights blew up and I had to borrow a head from Andy Kuno. I am glad photo days are over. It's kind of a hassle, but it has to be done. It's like going to the dentist," Margot concluded. Scottsdale resident Scott Wachter was the one photographer this morning that was able to sleep in his own bed. Wachter shot his first photo day in Florida in 1992. He currently shoots for Photofile and has been doing so since 1995. He also used to shoot photo days for the Major League Baseball Players Association for few years starting in 1995. "Some photo days are really easy and some are really difficult depending on the clubs and how organized they are," Wachter said. "The Kansas City Royals over in Surprise are super organized. The club gives you a lot of space to work with. I would rather be inside with space than outside on photo day. Ideally if I am outside I like to have some shade to work with," Wachter added. "The San Diego Padres and the Giants have by far the worst working conditions. There are so many factors involved. Some teams come out in full home whites. Other teams like the Giants come out in black batting practice tops and don't look as good," Wachter said. This is what the picture looked like of Moises Alou that Wachter was shooting in the picture above. Wachter describes his photo day assignments as "assembly line photography". Wachter is now in his third year of shooting digital photo days for Photofile. Shooting digital for Wachter is cost efficient but not time efficient. "I shoot an average of 800 images per photo day and I have to put each player in a separate folder. It probably takes me two-three hours after each shoot to finish the assignment on the computer. It can be real frustrating at times," Wachter said. Wachter says that most of the players are pretty good to deal with. 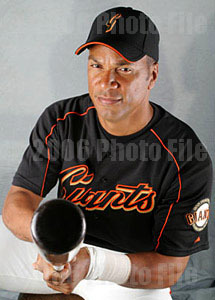 "I have done the Giants 12 years in a row and have never gotten Bonds to pose for me. Bonds is the only Cactus League player who has never posed for me at least once," said Wachter. Wachter observed that photo days go a lot quicker now because there are not as many shooters as there used to be back in the 90's. He adds that since he has done this so long he can finish each guy in 30 seconds- and the players really appreciate that. He says that he used to be a little intimidated by the players in his younger days. "It's better than an office job but it's not glamorous. I got up at 4:30am and got to the park at 5:45am. I was ready to go at 6:30am and first players came at 7:15am. I finished at about 9:30am," Wachter concluded. In a few days photographers will not have to get to the parks so early in the Cactus and Grapefruit Leagues as games will start at 1:05, meaning there will be fewer alarm clocks going off at 5:00am in Arizona and Florida. For every photographer covering spring training that is a GOOD thing - unless your name is Ben Margot and you enjoy that sorta thing!